Orawka is a little village located in Poland close to the border with Slovakia. Although today the village may seem sleepy and forgotten, for centuries it was a busy place being part of an important merchant tract crossing Carpathians and connecting Krakow (Cracow) with Prague, Vienna and southern Europe. Salt from famous Wieliczka mine, copper from rich mines in the vicinity of Banská Bystrica and millennium old amber trade for long were dominating exchanges between eastern and southern Europe. Importance of this merchant tract was recognized well back in the 14th century when the Polish king Casimirus the Great established a custom chamber in the nearby village of Jablonka to collect taxes. Orawka village is located in southern Poland close to the border with Slovakia on a busy road E77. Geographically Orawka belongs to the Upper Orava, a region occupying today’s southern Poland and northern Slovakia. Since the early time of 11th century the area was disputed by Polish, Czech and Hungarian Crowns often changing rulers’ hands. But frankly, it was mostly a deserted area of countless hills, valleys and forests. Things quickly changed in the 16th century once the Upper Orava became a private domain of the bishop of Nitra – Francis Thurzo. Realizing huge potential of this territory he started its colonization founding numerous villages and settlements. In 1585 F. Thurzo founded the village of Orawka and following the rule “Cuius regio – eius religio” (what can be translated from the Latin as: “The one who rules, imposes religion”) forcefully introduced Protestantism. Indeed, the first parish church in Orawka erected in 1614 was a protestant one. Since this area of the Upper Orava was inhabited by predominantly Catholic runaway peasants finding in this desolate area a refuge from the oppression of their landowners, Thurzo’s and his followers policy added only more oil to the already existing fire leading to resistance, further sectarian fighting and destruction. Scenes from the life of St. John the Baptist on the walls of Orawka's church. Not surprisingly, it did not take long for the local Catholic population to “counterbalance” the growing influence of Protestants. The first roman-catholic church in Orawka - St. John the Baptist, was established as part of the re-Catholicization process of the Upper Orava. The idea was not only promoted by the local Polish nobility (like for example the family of Moniaks from Zubrzyca Górna) but also gained the support of the Emperor Ferdinand III (Habsburg) trying to counter the effect of the Protestant Reformation spreading across this part of the Europe. In 1728 the chapel of Lady of Sorrows was added to the church. Today its white-finished brick walls beautifully stand out against the dark wooden structure as you can see on the following pictures. During the 19th and early 20th century church underwent further modifications – the major one connected the nave to the bell tower giving the final shape to the church – one we can witness and admire today. View on the St John the Baptist church in Orawka. 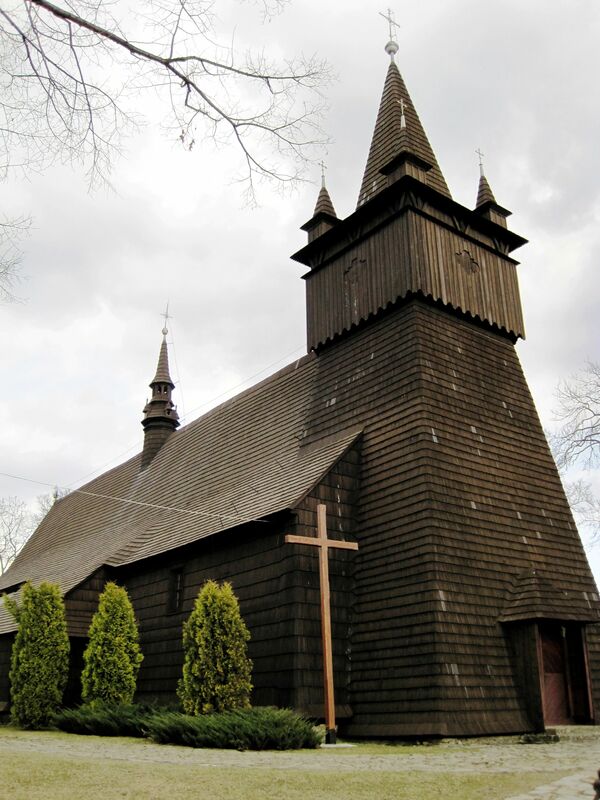 The church structure is covered by wooden shingles – till these days a typical roofing technique used in mountainous part of the southern Poland. The tower with slanting walls also covered by wooden shingles is crowned by the pyramid-shaped helmet flanked by four corner turrets dated from the 1900-1901 modifications. 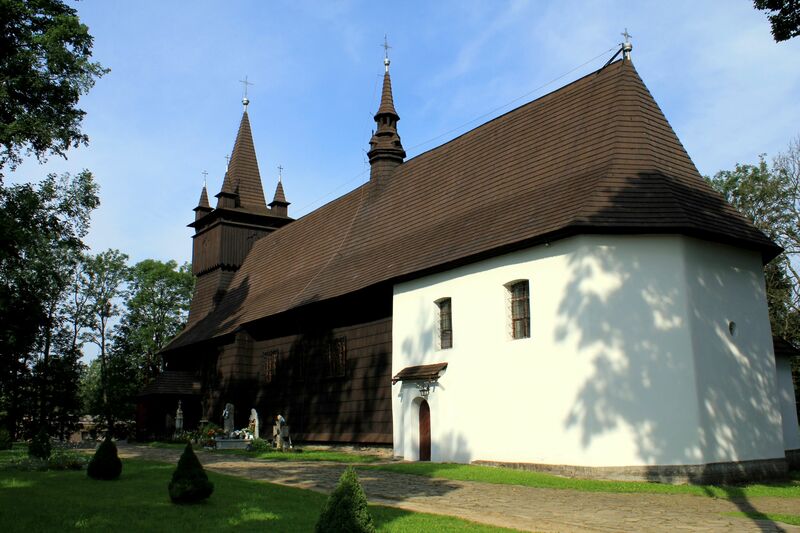 Today, Orawka’s church is the oldest existing wooden church in the Upper Orava. It represents an outstanding example of medieval sacral structures in Poland. Today it may seem odd to us, but let’s keep in mind that due to the widespread illiteracy at those times, this type of “looking- familiar” pictures was the only “language” easy to understand and accept. I guess the concept of the biblical events in the reality of the Middle-East landscape and customs was too far from everyday’s experience of peasants and possibly too abstract to be convincing …. Orawka's St John the Baptist church represents an outstanding example of medieval sacral structures in Poland. Paintings illustrating scenes from the life of St. John the Baptist on the church's ceiling. Themes from the Ten Commandments in a local scenery of the Upper Orava. From the left picture you will realize the overwhelming density of spiritual symbols, vibrancy of rainbow-colored paintings and richness of ornamentation – all concentrated in the small interior shell of the church. Frankly it will be difficult to find there an empty square-inch of wall or ceiling surface. Left: Confessional, Center: view from the Gallery, Right: Main entrance to the church is located under the bell tower (these days the side entrance is used to access the church). Due to the strong presence of the Hungarian Kingdom in the history of the Upper Orava the Orawka’s church includes many Hungarian accents. This certainly reflects the power and importance enjoyed by the Hungarian Kingdom since the time of its first Christian king - Stephen 1 (Árpád dynasty from the end of the 10th century). It also points to “warm” relationships with the Kingdom of Poland throughout the centuries. In the center of the nave, on both sides of the “rainbow” arch beam with the Crucifixion Group, there are crests of Ferdinand III (left side) as well as emblems of the Hungarian archbishop György (George) Lippay de Zombor (right side). On the gallery’s wall there are also heraldic signs of Polish nobility from the nearby villages – those of Bukowiński, Wilczek and Moniak. If at any time of this virtual guided tour you would like to visit another church, you can select it from the page City and more... under the section Churches, Temples, Pagodas..... or even better - from the list of Religious Places on the top of the right column.